The day of full moon(Purnima), in the month of Ashadh of the Hindu calendar is traditionally celebrated as Guru Purnima . Guru Purnima is celebrated in honor of Guru Veda Vyas. He is considered the Guru of Hindu Dharma, who wrote the Brahma Sutras, the eighteen Puranas and the Mahabharat. Veda Vyasa made several contributions to the Vedic literature. "He divided the Veda into four, namely Rig, Yajur, Sama and Atharva. The Itihasa(histories, Mahabharatha,Ramayana, Bhagavatha Puranas are said to be the fifth Veda." It was this dividing and editing that earned him the honorific title "Vyasa" (vyas = to edit, to divide). The festival is common to all spiritual traditions in Hinduism, where it is dedicated to the expression of gratitude towards the teacher by his/her disciple. Guru is the important part of our life, guru plays a vital role in boosting the aspirant frequently, when he becomes despondent or simply runs out of steam. Gurus can lead one on the path of happiness and help in attaining salvation from worldly existence. The “Gurus” are considered to represent God himself. Guru is the one who dispels the darkness of ignorance and infuses the light of awareness into our lives. 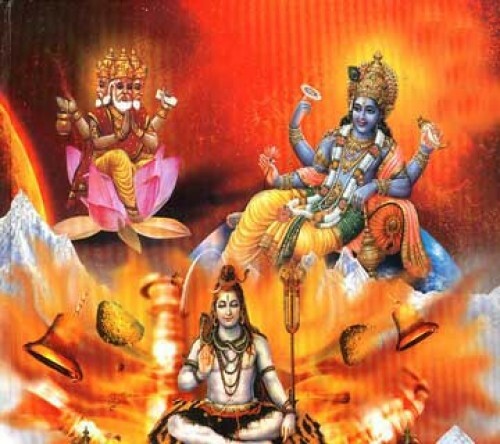 Brahma, Vishnu , Mahesh(Shiva) is the hindu Holy Trinity. The spiritual Gurus are revered on this day by remembering their life and teachings. Seekers try to get as much opportunity to do Satseva of the Guru as possible during this period. As the Guru principle is 1000 times more active during this period, when compared to any other day during this year, the satseva done on Guru Poornima fetches substantial grace of the Guru for their spiritual progress. The relationship between the Guru and the Disciple is considered very sacred. This relationship is purely spiritual in nature and is independent of age of the two. It is based on maturity of Gyan (Spiritual Knowledge) and Shradha (Spiritual Practice). The only awareness that a Disciple should foster is, ‘I should be uplifted spiritually’. The Guru too harbours only one thought, ‘May this Disciple be uplifted’. Relationships other than Guru-Disciple are bound by worldly restrictions wherein the ego constantly manifests itself while Gyan and other Shradha are spiritual . My Salutations to Mohan my Guru-Bandhoo. Salutations to Rahul & other members from whom I have learned so much. you are my Guru-Bandhoo too. Thanks to all Seekers/students who have given me respect of a Guru. My Blessings to all members. Wish you all Very Happy Guru Purnima. May everyone be blessed and guided by their Gurudev. hotice_steve wrote: My Salutations to Mohan my Guru-Bandhoo. Salutations to Rahul & other members from whom I have learned so much. you are my Guru-Bandhoo too. you are our Guru-Bandhoo too. Happy Guru Pournima to everyone. My thanks and blessings to everyone here. आप दोनो का हार्दिक आभार,...आप लोगो के सहयोग से मै अपने आध्यात्मिक जीवन मे प्रगति कर रहा हूँ. गुरु पूर्णिमा के पावन अवसर पर गुरुओं को सादर प्रणाम एवं सभी मित्रों को हार्दिक शुभकामनाये ..! गुरु के आदर्शों और आदेशों का पालन कर उनका सम्मान करें और जीवन का उद्देश्य उनके सानिध्य में पूर्ण करें! On the auspicious occasion of Guru Poornima kind regards to Gurus and best wishes to all friends ..! Must follow ideals and orders of Guru. Respect them and complete the purpose of life under the guidance of Guru. Shri Mohanji, Stephenji , Rahulji Evam Samast Guru Bandhuo ko mera Koti Koti pranam. समस्त गुरुजनों और सदस्यों को गुरु पूर्णिमा की हार्दिक शुभकामनाये. देखो, मैं हिन्दी में बात कर रहा हूँ! Happy Guru Purnima, everyone! I don't really know any Indian customs, and I can hardly pronounce the words you guys are saying, so I don't really have anything special to say. But I give my respect and blessings to everyone and to all the Gurus here and in the world! Guru Purnima is the day you reflect on your life and honor the wisdom that life has offered. It is a day to be grateful. When you see how wisdom has transformed your life, you feel grateful for all that has come your way. Celebrating this feeling of gratitude is Guru Purnima. Wisdom is there in each and every one of us, but we must throw light on our life, because when we throw light on our life, wisdom dawns. So everyday could be Guru Purnima in your life when you honor what life has taught you.